President Donald Trump met with Palestinian President Mahmoud Abbas and expressed desire for peace between Israel and Palestine. President Trump met with Palestinian President Mahmoud Abbas at the White House and talked about his hopes for peace between Palestine and Israel. "Let's see if we can find a solution. It's something that I think is frankly maybe not as difficult as people have thought over the years, but we need two willing parties," Trump said. 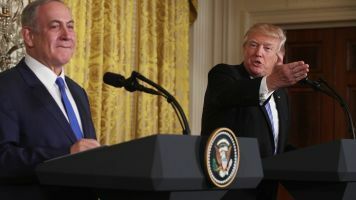 Abbas pointed toward a likely partnership while crediting Trump's "great negotiating ability." Trump has tasked his adviser and son-in-law Jared Kushner and lawyer Jason Greenblatt with tackling the issue. But he hasn't outlined a clear course of action just yet. In February, Trump met with Israeli Prime Minister Benjamin Netanyahu and broke with decades of U.S. policy by signaling he might be open to a one-state solution. "So I'm looking at two-state and one-state, and I like the one that both parties like. ... I thought for a while the two-state looked like the easier of the two, but honestly if Israel and the Palestinians are happy, I'm happy with the one they like the best," Trump said. Many of Trump's predecessors have tried to mediate the decadeslong conflict. But there's been little to no lasting progress to show for it.